Berries just may be my favorite food. Maybe the fact you can only get them a certain time of the year fresh adds to their mystique. I love them all strawberries, blueberries, blackberries, and raspberries too. 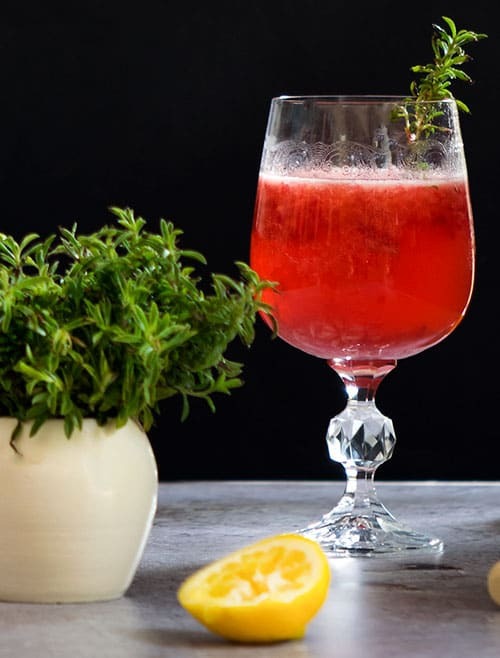 Today, I have a recipe for a Fresh Raspberry and Thyme Gin Cocktail. Of course you can make this into a mocktail by adding sparkling water instead of the gin, just leave out the water too. Or make a homemade raspberry thyme lemonade. Be creative and you’ll surprise yourself at what you come up with. If you’re not a gin fan you can use vodka, bourbon, or even substitute a little some sparkling wine instead. In fact, you can add a little gin, leave out the water and use sparkling wine instead. 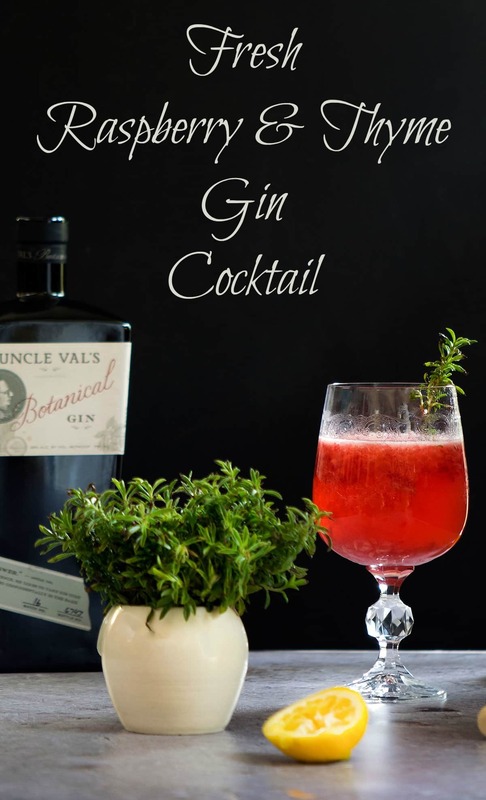 I love the juniper flavor from the gin and it really works well with the fresh thyme. 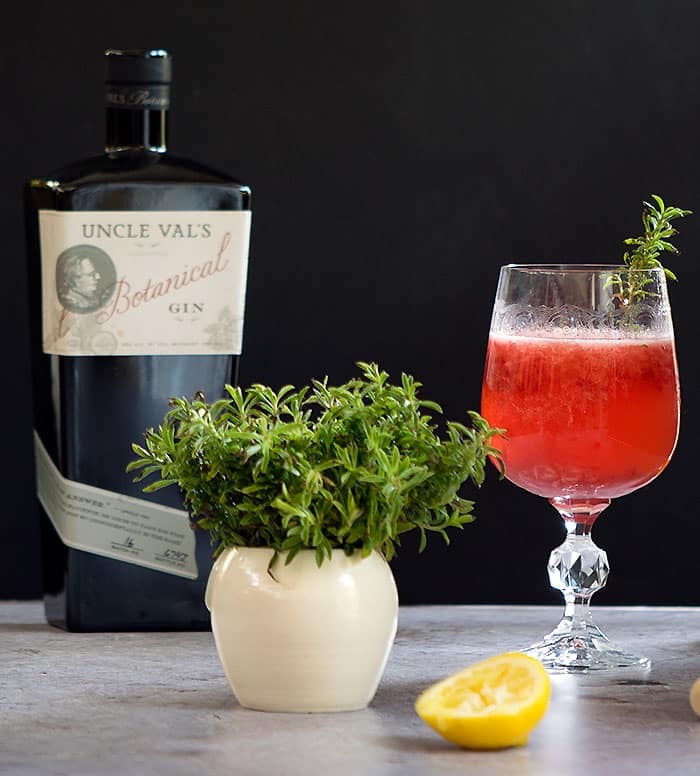 Uncle Val’s is one of my favorite gins and it has a hint of sage and lavender too. You can mix and match the berries and herbs. Try strawberries with basil, blueberries with mint, or blackberry with lemon balm. When I’m not eating berries straight from the package I often make drinks or drink syrups with them. Be sure to try my Homemade Blueberry Thyme Syrup and Nancie McDermott’s Strawberry Shrub while the berries are still in season! Tell me in the comments what you love to make with fresh berries so I can try it too! Muddle the thyme and raspberries then add the rest of the ingredients. 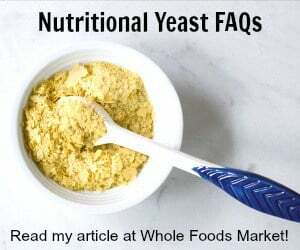 Serve with lots of crushed ice. The ingredients are for 1 cocktail. You need to make them in individual glasses to keep all the good juice from the muddled raspberries right where it belongs. « Vegan Blueberry Buckle – No Oil Added!